Get ready. You are about to crochet the cutest, fastest crochet star you’ve ever seen. One day, I was wandering in Hobby Lobby and spied some cute holiday buttons. I remember seeing a Christmas Tree decoration out of granny squares and thought the buttons would make the perfect ornaments…only I needed a star and a tree trunk. You can check the tree pattern out here. 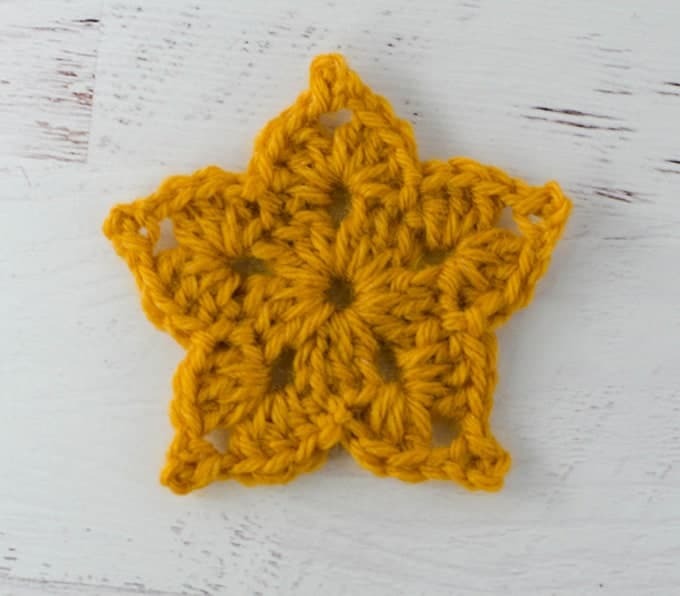 Today I am sharing the crochet star pattern with you. It is easy and quick to make and you can use it as an ornament, in place of a bow on a gift, or as an embellishment on a hat or really anything. Best of all, it uses hardly any yarn, so you can make it out of stash yarn. Who doesn’t love that? Ch 5 and join with sl st to form a ring. Easy, peasy, right? 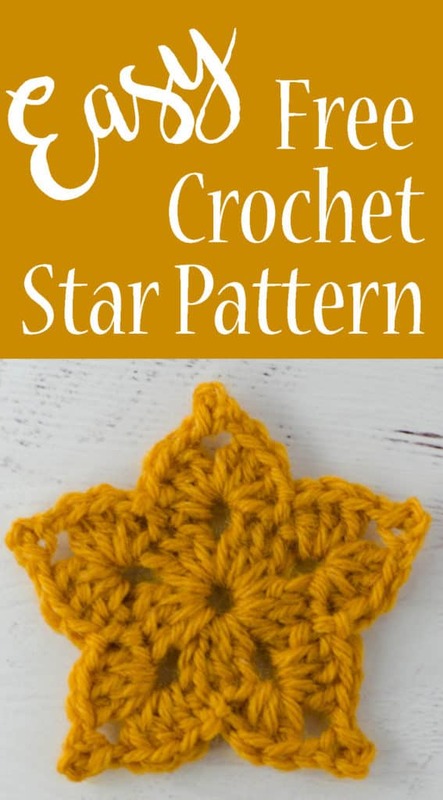 I hope you enjoyed this Crochet Star Pattern. I’d love to hear how you plan to use it! I loved this pattern. I used it for the top of my granny square Christmas Tree. It is perfect. I cannot wait to try this pattern. I love so many of you creative patterns. Thank you so much for sharing. I plan to make several, I am making Christmas tree ornaments for friends/family for the holiday. I will post on Instagram… I think. It is 2 rows. Row 1 is worked into the ch-5 ring. If you look you can see 5 groupings of stitches. That is the first row. You don’t turn the work. You join the work at the end of round 1. Then for round 2, just carefully follow the instructions step by step. The extra chains, etc. create those decorative points. I figured it out by watching a Granny square video. Love this!